Tech Valley High senior James Piambino of Cobleskill-Richmondville and Al Lively of Germantown were paired up to work together during an Arduino workshop on Feb. 17. 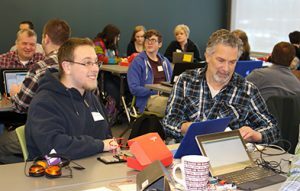 Students and teachers learned side-by-side when 20 educators from around the region joined Tech Valley High School for a free computer science workshop. The event, titled “Do You Arduino?” introduced educators to the Arduino microcontroller. Arduino is a small, programmable, low-cost circuit board that is energizing the “maker” movement worldwide. By coding this little device, you might control a greenhouse irrigation system, build a burglar alarm or drive an autonomous vehicle. As explained by its website, Arduino boards are able to read inputs — light on a sensor, a finger on a button, or a Twitter message — and turn it into an output — activating a motor, turning on an LED, publishing something online. Participants were joined by Tech Valley High’s computer science students. Together, they learned how to use the tool and “processing” (the free companion language to Arduino), sensors, circuits, and hands-on basics. Two educators were able to take TVHS’ Arduino Maker Kits with all the gear needed to immediately turnkey this coding work with their students. The workshop was led by Jeff Branson, who directs the Department of Education at SparkFun Electronics in Boulder Colorado. SparkFun is an open-source company specializing in providing tools and training for prototyping with technology. Participants included secondary educators from Germantown, Questar III BOCES, Albany Leadership Charter High School for Girls, Canajoharie, Ichabod Crane, Burnt Hills-Ballston Lake, Mohonasen and Schuylerville. The workshop is part of the Tech Valley High Outreach Program’s continuing computer science professional development, which is offered to component districts at no cost. This year, Tech Valley High has hosted two sections of “Code U,” an introductory coding workshop, and “Gamestorming,” where teachers were exposed to gaming in education resources.